Look no further for committed specialists to take care of all your carpet, upholstery and fabric needs. Edinburgh Cleaning Services offer a comprehensive cleaning care service. Designed to bring life back to your existing carpets and upholstery. Our qualified technicians are experts in matching products to fabrics. This ensures they get it right first time - every time providing a dazzling finish. As part of our commitment to customer service, we happily move furniture. We also offer flexible evening and Saturday bookings. 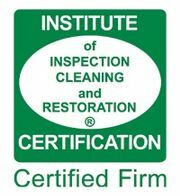 Our memberships include the NCCA (National Carpet Cleaners Association and IICRC (The Institute of Inspection, Cleaning and Restoration Certification). We are also one of the only floor-cleaning companies in Scotland to be TrustMark-accredited. Enjoy the highest levels of hygiene for your home. This is particularly essential when you have pets or young children. Our technology takes care of your carpeting and soft furnishing needs. Creating an environment that is cleaner and safer for your household. Contact Edinburgh Cleaning Services today on 0131 660 0220 for unbeatable carpet cleaning at highly competitive prices. Alternatively, email us at info@edinburghcleaningservices.co.uk and request a quote for your furniture care.